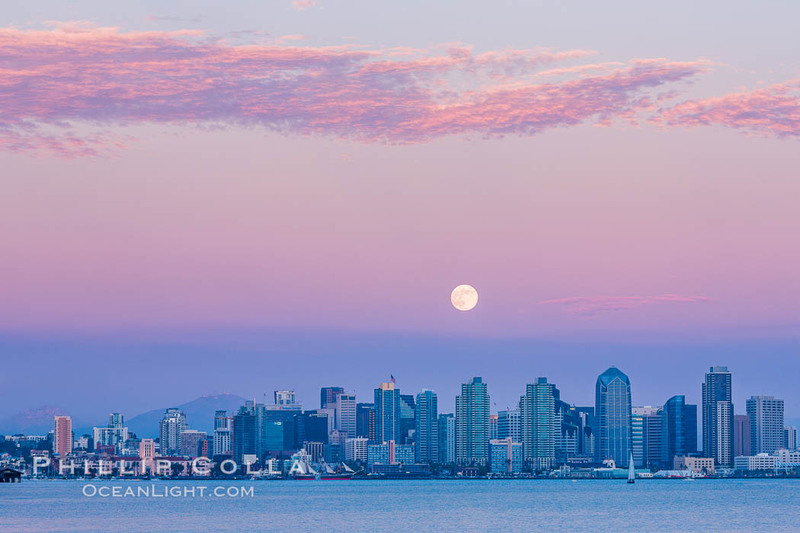 Tonight I was fortunate to photograph a rare “blue moon” rising at sunset over San Diego’s beautiful city skyline. This view is from Harbor Island looking across San Diego Bay toward the downtown waterfront. Tonight’s full moon is indeed a “blue moon”. What is a “blue moon” you ask? Typically a season, such as summer, will have only three full moons. On those occasions when four full moons occur during a given season, the third full moon is called a “blue moon”. (Note the oft-quoted “second full moon in a single month” is actually incorrect!) Remarkably, a jet plane on approach to San Diego airport flew right in front of the full moon, and the light of the setting sun just balanced that of the rising blue moon allowing a photograph to be made showing the jet with its headlights on against the sharp detail of the moon, with San Diego’s beautiful skyline set below. No photoshop trickery here. The jet is a tiny black spot on the moon in the first image below, but since this photograph will print beautifully up to 24″ x 36″ you’ll be able to see the jet clearly set against the moon in the print hanging in your living room or office lobby! Cheers, and thanks for looking! Blue Moon at Sunset over San Diego City Skyline. 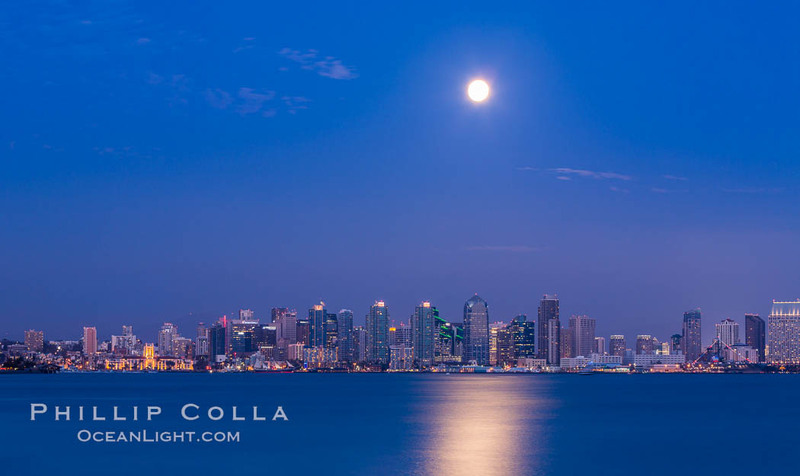 The third full moon in a season, this rare “blue moon” rises over San Diego just after sundown. If you like this, please check out more of my San Diego City Skyline photos. For you photographers that might wonder: this is a single raw image, with no local processing applied (only global adjustments for white balance, saturation, contrast and sharpness), and the moon is not composited. There are a few minutes each day when the exposure of for the moon is within a stop or two of the correct exposure for the landscape, and at those times a balanced moonrise or moonset photo can be taken with a natural, honest-looking moon that requires no photoshop compositing. Personally I have never composited the moon (or the sun for that matter) into a composition, it never looks natural to my eye. Cheers, and thanks for looking!